The Canadian Rockies are known for epic mountain and lake scenes, beautiful peaked mountains with colorful lakes sitting at their base. Moraine Lake, Lake Louise, and Peyto Lake, just to name a few. When we set out on our nearly week long trip to Banff National Park I expected to see as many of these mountain scenes as I could. Willie and I explored the area close to Banff National Park on our first few days, when the weather was clear and easy to get the lay of the land. Then a big snow storm hit and dumped over a foot of snow on the area. Our ability to venture further out and see many of these epic mountain scenes began to decline. On our last full day in Banff I turned to Willie and said theres no way were coming here and not seeing Peyto. Hop in the car, were going And off we went … which Willie was perfectly fine with since he wasnt driving and could do his typical thing: fall asleep. 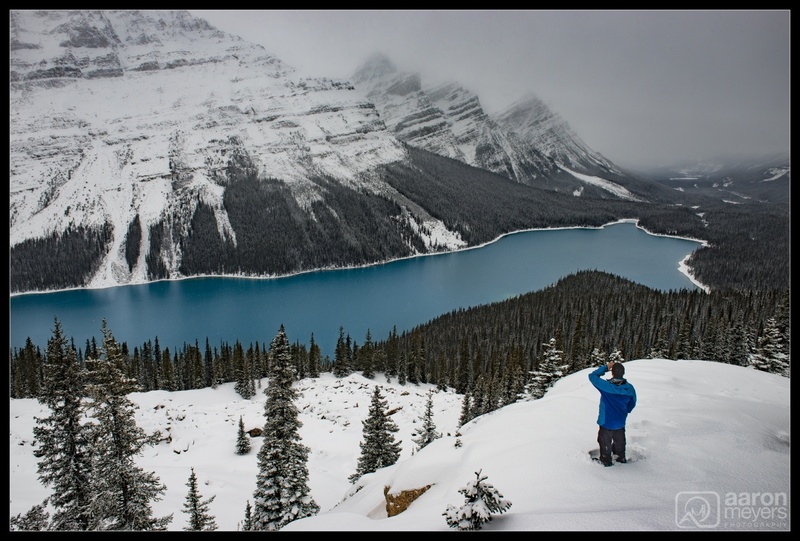 Although the epic mountains behind Peyto Lake never made an appearance, it was still an epic view Ive been wanting to put more of a people element into my photos lately, so when Willie was done taking his photos I hopped on down and placed myself in the photo.